Medical examiners in metro Detroit have become overwhelmed in the past few years as the number of drug-related deaths continues to rise. “The days when we come in and have no cases on any given day or one or two, they are pretty much gone,” said Dr. Daniel Spitz, a medical examiner in Macomb County. In Macomb County, the drug-related deaths jumped from 280 in 2015 to 380 in 2017, greatly increasing the workload and stress on a facility with only two medical examiners. Medical examiners in metro Detroit have become overwhelmed in the past few years as the number of drug-related deaths continues to rise. “The days when we come in and have no cases on any given day or one or two, they are pretty much gone,” said Dr. Daniel Spitz, a medical examiner in Macomb County. In Macomb County, the drug-related deaths jumped from 280 in 2015 to 380 in 2017, greatly increasing the workload and stress on a facility with only two medical examiners. The problem is not just in Macomb County. Oakland County has also seen their drug-related deaths increase more than 35 percent from 2015 to 2017. For the staff and medical examiners at each of these counties, it is not just the extra workload. To remain accredited by the National Association of Medical Examiners, each examiner can only perform 325 autopsies per year max, with a recommendation of no more than 250 examinations per year. “Here in Macomb County, we are pretty close to those numbers, so we’ve hired some additional people,” Dr. Spitz said. Macomb County has hired part-time pathologists to help with the extra workload since they have two medical examiners. In Oakland County, there are five pathologists, so they have not had to hire outside help yet. 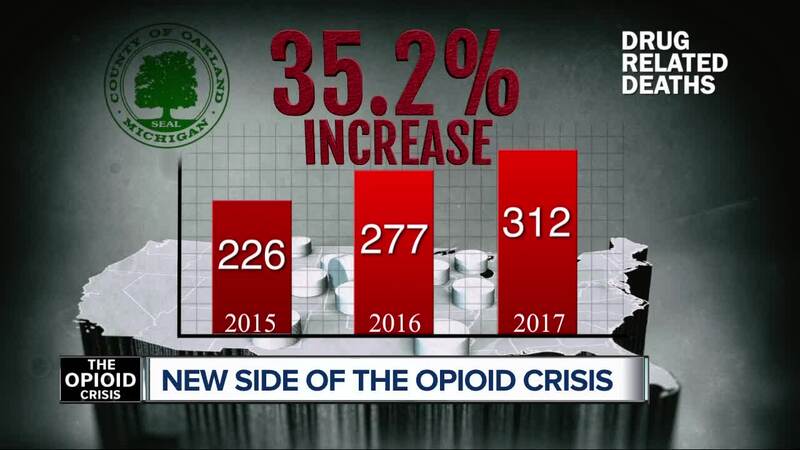 “If these numbers were to skyrocket even more and more and you start reaching numbers like 3, 4, 500 cases a year, you’d really have to examine, because that is quite a caseload on the pathologist,” Miarka said. Ali Charara with Marko Law says, if a facility loses accreditation, they may still perform autopsies. However, the weight of their testimony in court would be greatly diminished. “It would be a dream for me if they’re not my expert. But it’s a nightmare for me if they are my expert,” Charara said. Charara said the testimony would be scrutinized and in the end, it could cost them the case. “At the end of the day, if a medical facility loses its accreditation, it’s definitely going to be a point on cross-examination of that expert, whether we like it or not,” Charara said. Dr. Spitz said if the trends continue to go up, they will have to talk with the county commissioners about getting another full-time pathologist for the county.